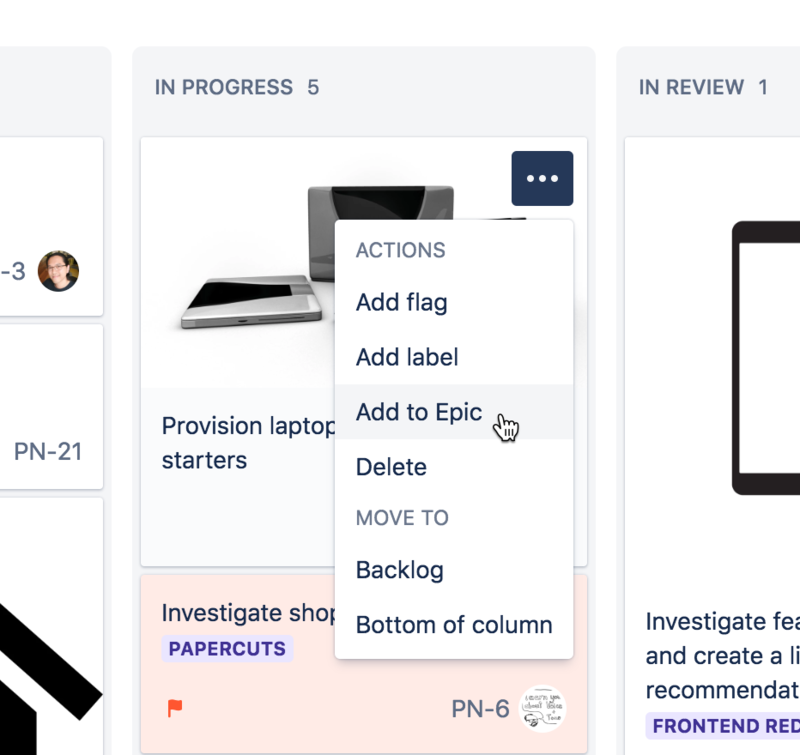 We've just introduced Epics to next-gen Software projects and with that comes a new way to manage them: the Roadmap. 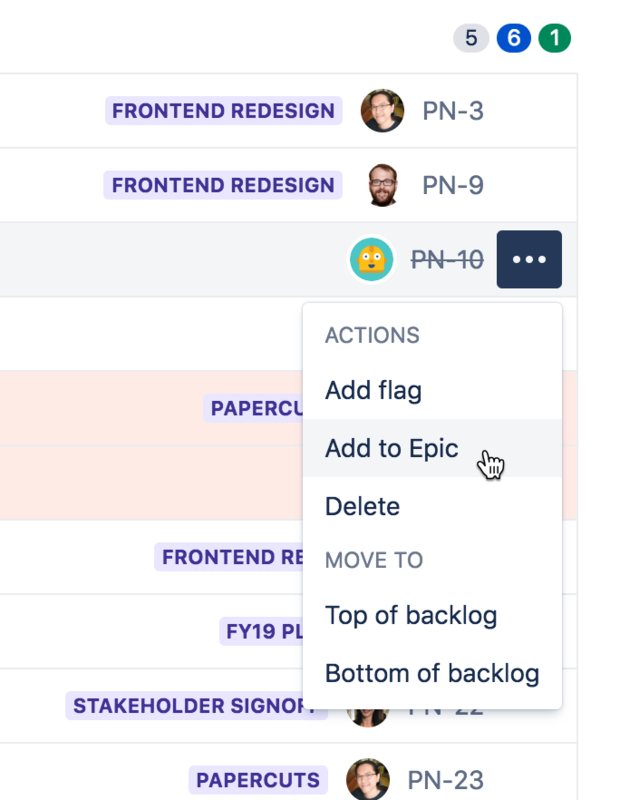 This represents a huge and exciting change in how Epics are managed in Jira Software Cloud. We believe this will be an easier way to manage and visualize your epics and would love to hear what you think about it. This tutorial explains how epics generally fit into the agile development process and shows how to work with epics in next-gen projects to help you with your next big project. What's the difference between epics and other issue types? Stories, bugs, and tasks are used to describe one single piece of work, while epics are used to describe a group of issues that all relate to the same, larger body of work. Epics are typically completed over several sprints, or a longer time frame if you don't use sprints. Check out our guide on delivery vehicles for more info. Epics are created and managed in the Roadmap. The Roadmap is useful for visualizing and planning large pieces of work that may be in progress right now or you may prioritize in the future. When should I create an epic? Consider creating an epic if you have a large body of work that needs to be completed over several sprints or over a long period of time. You could also create an epic if you notice a pattern amongst several user stories you've created, and you want to bundle them into one group. In the project menu, select Roadmap. Hit the + in the first column to create an epic. If your roadmap is empty, you can just start typing to create your first epic. Pro tip: Outside the Roadmap, you can also create epics from the global menu. Drag the edges of an epic's bar to modify its start and due dates. You can also edit these dates by clicking an epic and opening its details. You don't have to set start and due dates, but we recommend you do to make long-term planning easier. Navigate to your Board or Backlog. Hover over the issue and select more (•••). Select Add to Epic*. Issues can only belong to one epic at a time. If an issue already belongs to an epic, the Add epic option will be replaced by Change Epic*. In the issue details panel, select Add a child issue. Pro tip: You can select multiple issues with Command + Click on Mac or Ctrl + Click on Windows, and add them all to an epic at the same time. You can view an epic's details, like start date, due date, and child issues by selecting it on the Roadmap. Navigate to your next-gen board. In the top-right corner, select the Group by menu. Pro tip: You can create issues under an epic swimlane to quickly add a new issue to an epic. This also works if you've selected an epic in your filter. Once all the work for an epic is completed, you should mark it as complete on the roadmap. Select the epic you'd like to mark as complete. When should I mark an epic as done? Mark your epic as done whenever all work for the epic is complete. To make this easier, we recommend coming up with a clear definition of done for your epic when you create it. To learn more about the Roadmap, check out the Roadmap documentation. To learn more about configuring your issue types, including epics, check out our next-gen projects documentation. Doesn't really explain how to add roadmaps 'In the project menu, select Roadmap.' which project menu?? Is there any plan to support proper epic linking between Jira Portfolio and Jira Software epics? At the moment I'm having to assign child issues to epics twice, once in Portfolio and once in the new Roadmap view. It seems like there is two lists of child issues instead of one. Why did you remove the Epics side panel from the backlog, it was a lot more convenient to just drag and drop issues into epics, and also keep an eye on backlog's issues and epics at the same time!! And why I cant color tag the epics anymore !! @James Fleming apologies for our delayed response. The new roadmaps feature is only available in next-gen projects. If you are using a next-gen project, then you'll see the roadmap icon in the navigation. Hi @Sam Storer - not at this time. Your feedback is important to us - thank you for sharing this wiht us. I can't speak for Mahmoud, but for me the simplicity of arranging, rearranging and drilling down and up again directly from the backlog was key. That feels like one of those things that are just plain awesome for so many usecases in the traditional Jira interface that I'd like to add my little vote on bringing that component into the "new Jira experience". @Henrik Öquist Thanks very much for your feedback - we really appreciate it. Hi @Romy Lindenberg - Thanks so much for your feedback. I'm happy to let you know that epic colors are on our radar, and the team is working on a simple way to customize colors on the Roadmap. Wow this is so much more simpler than the traditional project. Great Job! Maybe it will just take some getting used to but I agree with Henrik and Mahmoud that it feels like a real handicap not to be able to drag and drop issues onto an Epic from the backlog. I will often create issues on the backlog screen and then want to assign them to an Epic. Out of the box I struggled to do that, not noticing the hover dots and wondering why Add to Epic wasn't shown on the dots menu in the right-hand pane. Or when you hit . and start typing 'epic'. Even now that I know about the hover dots menu, it still feels a lot clunkier than a nice drag and drop. Also, I found it very counterintuitive that "Add Child Issue" from the Roadmap screen only creates issues. There seems to be no way to link existing issues from within the Roadmap screen. So you end up switching back and forth a lot, which is a real pain. @Romy Lindenberg we can't give specific timings unfortunately but I can say that it's very highly prioritised, so stay tuned :) - Bree, Jira Software PM. Agree with @Michael Pavey @Mahmoud Elmashad. When you start managing a large backlog, the ability to drag stories and issues into epic buckets is needed. We have about 2000 items in the backlog, and use versions + epics + components to bucket attempt to manage and organize our backlog. Epic itself should rollup all stories / actual time logged so you can see in one place (perhaps on the gantt roadmap view) estimated effort, and actual effort post-mortem to see how successful the team was executing on a particular feature in the roadmap. Is it possible to have components in ‘agility’ type of project? I Don’t see this in options. How issues can be split to categories at the moment in ‘agility’ project. Love the roadmap, can it be added to kanban project somehow? Where do I get this "next-gen" project? This seem to be very confusing. When i click on "Add new project", All i see is "Agility", "Scrum", "Kanban" etc..I created with Scrum template and there is no "Roadmap" option. And your next-gen project help page is as helpful as it gets. Another vote here for drag & drop assignment of issues to epics + versions, in the backlog page i kept looking for the 'add to epic' option in the menu of the right hand pane and didn't realise there would be different options available in the menu on the list item. It's very common for us to define a set of individual issues and then group them into an epic later, or break an epic up into several smaller ones if it's getting too big, so doing that sort of thing is so much easier with the old drag & drop behaviour. No option to create sub-tasks. No option to enable sub-tasks. Probably a dumb question - but I can't seem to see the option to colour-code my epics anymore... where has it gone? @Edmund Munday - not a dumb question! We don't support that just yet, but we're working on it. Coming soon! Best features so far are the ease of controlling visibility of boards, and being able to visualise my roadmap to stakeholders. Massive+1 on having different colours for epics (or better still being able to specify your own). I'm moving issues from an old board to a next-gen one, and have just noticed the issues I've moved across are tied to the epic in the old board - how do I remove that relationship? ?